Lincoln, NE — The presidency of John F. Kennedy is remembered for more than it’s tragic end 50 years ago. The NET News special reporting project “JFK Revisited” talks with Nebraska historians and political scientists about the Kennedy legacy, especially how we see and perceive the presidency. Historians and political scientists say the legacy of Kennedy’s abbreviated term lasted longer than his less than three years in the White House. The 1960 Nixon-Kennedy debate is one example. It was broadcast live on radio and television. Radio listeners gave Nixon the edge; but Kennedy won with television viewers. A new era of media politics arrived. “When they got done somebody who was counseling John F. Kennedy said, ‘I think we’ve just elected a President and I’m not sure this is the way we should do it,’” said Sara Crook, professor of history and social science at Peru State College. Crook calls Kennedy the first media president, something that’s influenced the presidency since. “I do think in today’s society you have to be telegenic to be electable and I’m not sure that’s necessarily a great criteria,” Crook said. 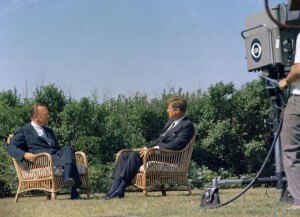 Kennedy benefited from being the right president for the dawn of the television era, according to John Vermeer, retired Nebraska Wesleyan University political science professor. Vermeer said Kennedy understood how to use this to his advantage. “Kennedy was the first, really, to hold live televised press conferences,” Vermeer said. “There were televised press conferences under Eisenhower, but, if not scripted, questions had to be submitted in advance and there wasn’t a give and take. Kennedy did it live and we still expect presidents to do that live. Vermeer said Kennedy’s assassination, only captured on film by amateur photographer Abraham Zapruder, led to television cameras following future presidents at all times. “When that happened, the intensity of personality of the person increased so much that it was harder to ignore the outside events,” Vermeer said. As a result, in years that followed we’ve seen television coverage of everything from the assassination attempt on Ronald Reagan to Bill Clinton stopping for a hamburger while jogging. Nebraska Wesleyan history professor Meghan Winchell said Kennedy changed the way we view the presidency. Crook said Kennedy’s image, in combination with some issues of the time, helped bring new demographic groups into politics. “Getting more women involved and maybe setting the stage in many ways for young people to feel like they can make a change, that you don’t have to be 60 and bald to vote,” Crook said. Kennedy also set the tone for presidents cultivating the media and controlling the agenda or message coming daily from the White House, according to Peru State history and social sciences professor Spencer Davis. 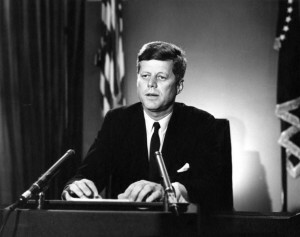 Two of Kennedy’s most defining policy legacies are civil rights, starting the path toward the landmark Civil Rights Act of 1964, and avoiding nuclear war though negotiations with the Soviet Union during the Cuban Missile Crisis, then setting the stage of the end of the Cold War through negotiating a Nuclear Test Ban treaty. “I think those were two big things,” Davis said. “It’s more promise than it was actual completed programs, but I think he set a course that was important. In general, there’s a belief Kennedy’s political legacy was viewed more positively because it ended tragically. Vermeer called it the myth of Camelot. “We look back at it through rose colored glasses,” Vermeer said. “There were lots of problems that Kennedy had with the media. There were lots of problems Kennedy had with Congress. There were lots of decisions that he was waffling on; civil rights, Vietnam. He really didn’t take firm positions on those issues. But we tend to look back and see it as an idyllic time.